- Sarah Palin, Facebook, August 7, 2009. In 2009, Sarah Palin made her famous statement about old people and her child with Down Syndrome. She brought the words, "Death panel" into our national discourse, and our national discourse has been much the poorer for it. It was, of course, entirely untrue. But it sounded true to her followers. It sounded useful to those who wanted to use her followers to leverage their way into power. It was just the first step in the campaign of lies and dire prophecies against the Affordable Care Act. At the time, I wasn't an op-ed writer, so I kept quiet, but I often thought that she fundamentally didn't understand what people with disabilities (who aren't Fox News Millionaires) need from their government and their health care systems. We need flexibility. We need reliability. We need affordability. Generally, the private market cannot provide all of these things: affordable care is limited care. Flexible care is expensive care. The bureaucracy of private care rivals anything that the government might concoct. One of the tricky parts of the ACA is that it isn't composed of a single, popular, program. Rather, it merges a wide range of subsidies, regulations, policies, and small programs into a meshed system that, the architects hope, will provide more coverage to more Americans, do so at a lower cost, and do so without increasing the deficit. It contains myriad small elements that are often invisible to those who don't need them, but are nonetheless important. 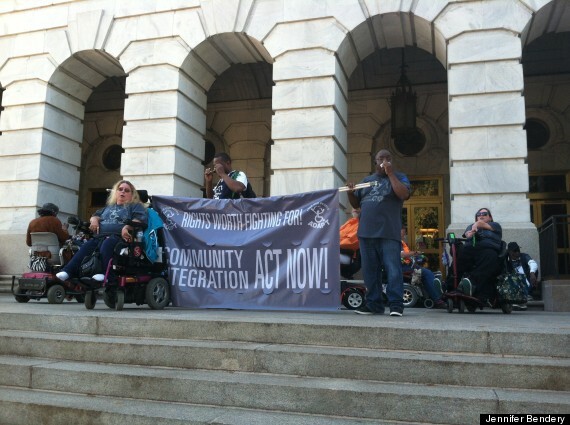 Yesterday, a group of disabled Americans came to Washington to protest the (then) upcoming shutdown. They were concerned about the lack of support for one such program, the "Community First" program. And so the wheelchairs rolled to Congress. Armed with megaphones and banners, the protesters took over the steps of several entrances into the Longworth building and criticized Boehner for trying to attach a one-year delay of the Affordable Care Act to a bill to keep the government funded past Monday. Specifically, they argued that without the health care law in effect, they would lose the Community First Option, a program that provides matching federal funds to states to help people with disabilities use home-based care instead of institutionalized care or nursing homes. So how did their protest go? A Boehner spokeswoman declined to comment on the protesters. Instead, she pointed to statements Boehner has made in the past couple days about the Senate needing to "listen to the American people" and delay Obamacare when it passes the government-funding bill. This is the kind of program that I think could generate broad consensus, as is true with most of the provisions of the ACA. It lets people get care in their homes rather than in institution. It's flexible. It's reliable. It's affordable. It's just one example of how 'Obamacare' will make this country better, more inclusive, and safer, for people with disabilties.